The RETRAX™ is the bed cover that’s everything you’ve been looking for. Introduced over eight years ago, the unique hi-tech design has set a new standard for the industry. The RETRAX™ bed cover design is unique because it is “flat from front to back”, which allows water to flow off quickly without obstruction, resulting in a drier bed. 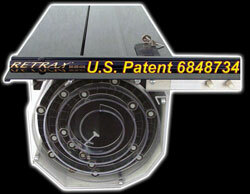 This patent pending design is engineered tough and streamlines the overall appearance of the cover. When you purchase a RETRAX™, you are buying the very best. Sealed ball-bearing rollers mounted into the aluminum support beams allow the RETRAX™ truck bed covers to retract or close effortlessly without the use of springs or any kind of mechanism. At each corner of the RETRAX™ pickup truck bed covers is an anti-bind ball-bearing roller mounted sideways (horizontally) to ensure that the RETRAX™ pickup truck bed covers will move smoothly without binding regardless of where you push or pull. There is no tow strap required to move the RETRAX™ tonneau covers, just a simple push from any location on the bed cover. RETRAX ™ is all about access. When you need access to your pickup bed simply release the flush-mounted latch with the touch of a button and the cover glides out of your way with just one hand. Enjoy instant access – no snaps to fight with, no tarp to roll up. The RETRAX ™ pickup truck bed covers can be latched or key-locked in any position along the bed rail to allow unlimited hauling flexibility and convenient use with a fifth-wheel trailer. Enjoy complete access – unlike toppers or lift-up fiberglass lids – the RETRAX ™ won’t obstruct your cargo area when you need it most. Enjoy secure access – the secure key lock system offers protection that no soft tonneau cover can. Use your pickup truck for traveling, shopping, working, hauling and more with the kind of convenience, flexibility and security that only RETRAX ™ can offer. The patented RETRAX ™ truck bed cover is unique because it is manufactured from polycarbonate, a durable thermoplastic commonly known as LEXAN®. This low-profile design incorporates a front cover that is flush with the rolling cover, which streamlines the overall appearance and provides a firm, dependable seal to help to keep the bed dry. This rigid, one-piece sheet is engineered to retract without joints or hinges that can trap dust, wear out or freeze. Polycarbonate has excellent impact resistance and is unharmed by sun, moisture or temperatures from -50 to +200 degrees F. The RETRAX ™ is maintenance-free and its low-profile design has a gloss-black finish that is UV treated for years of protection from the sun. Our engineers utilized the same polymer technology in fighter-jet windshields and bullet-proof glass and designed pickup truck bed covers that withstand the most rugged use. The RETRAX ™ roll top truck bed covers provide our customers with the “security” and “convenient cargo protection” they deserve. The RETRAX ™ is backed by a one year warranty. Open a RETRAX™ truck bed cover and you will immediately be impressed at the way it smoothly glides back and forth at your slightest touch. Sealed ball-bearing rollers mounted into the aluminum support beams allow the RETRAX™ tonneau covers to retract or close effortlessly without the use of springs or any kind of mechanism. No moving parts to jam, freeze or fail. The total weight of the Retrax truck bed covers is 65-80 lbs. depending on the model. The compact storage canister contains a unique spiral track system that prevents the pickup truck bed cover from touching itself as it retracts. The RETRAX™ canister dimensions are approximately 11″ square. The canister assembly is located at the front of the pickup truck bed. The distance between the bottom of the canister and the floor of the pickup bed is 7″ to 11″ depending on the model of truck. The height of the RETRAX™ rails is 9/16″ above the pickup bed rail when installed. Tempered aluminum support beams imbedded into the polycarbonate sheet add strength to support heavy snow loads and insure quiet, stable travel at any speed. The rigid design of the RETRAX™ roll top truck bed covers improves the aerodynamics of your pickup for an increase of approximately 10% in your gas mileage. The RETRAX™ tonneau covers glide back and forth in a low-profile rail system made from high-strength tempered aluminum for years of rugged use. Rubber trim on the rails protects your paint and seals against the pickup bed rail. The rail system was engineered to provide a clean, finished look that transitions the RETRAX™ tonneau cover into the lines of your pickup for an unbeatable custom appearance.